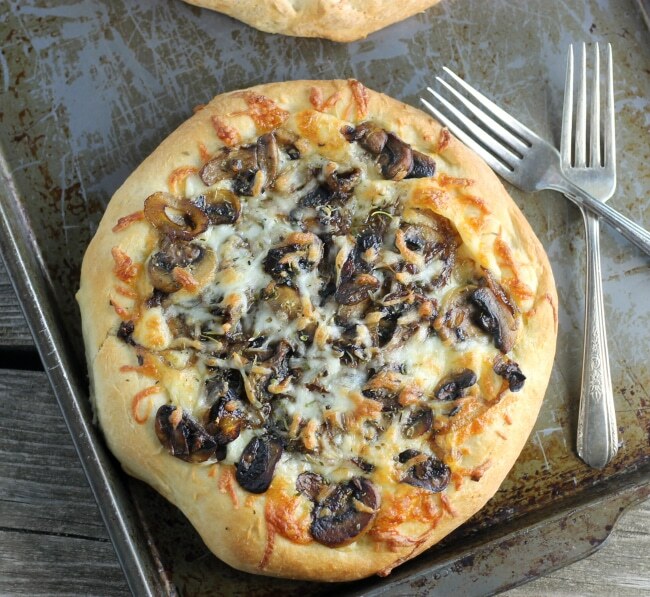 Caramelized onion & mushroom pizza easy and delicious, great for a meatless meal. I love homemade pizza, it’s so much better than anything you can buy. Fresh hot pizza out of the oven and that smell oh yeah that smell is the best. Most people today are thinking about Valentine’s Day, which is tomorrow. But today marks the first day of Lent. Some of you may be looking for some meatless meal ideas. For me soup is my choice for lunch. I like to have a soup that is packed full of vegetables. 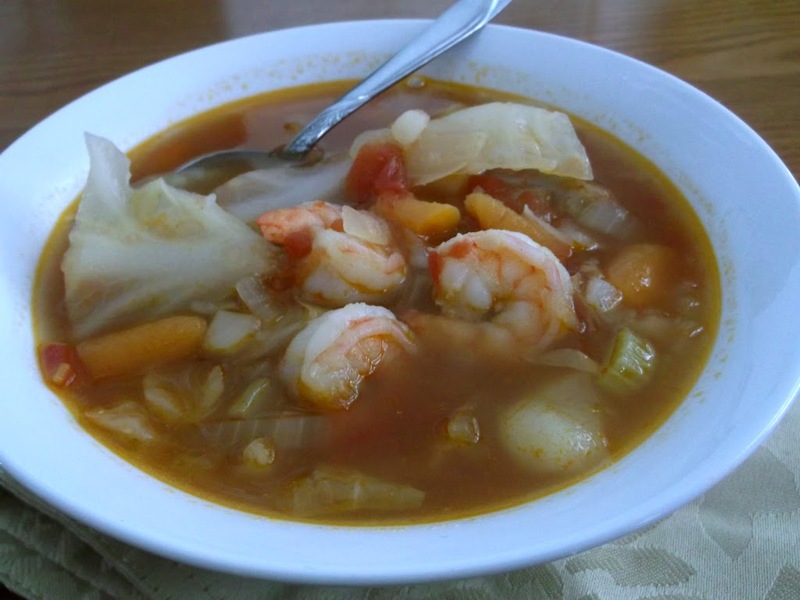 Normally I would use chicken or beef , but for the start of Lent I decided on a vegetable broth based soup with shrimp for the protein. I didn’t want to make a soup with a heavy creamy base, so I went with vegetable broth and loaded with lots of vegetables. 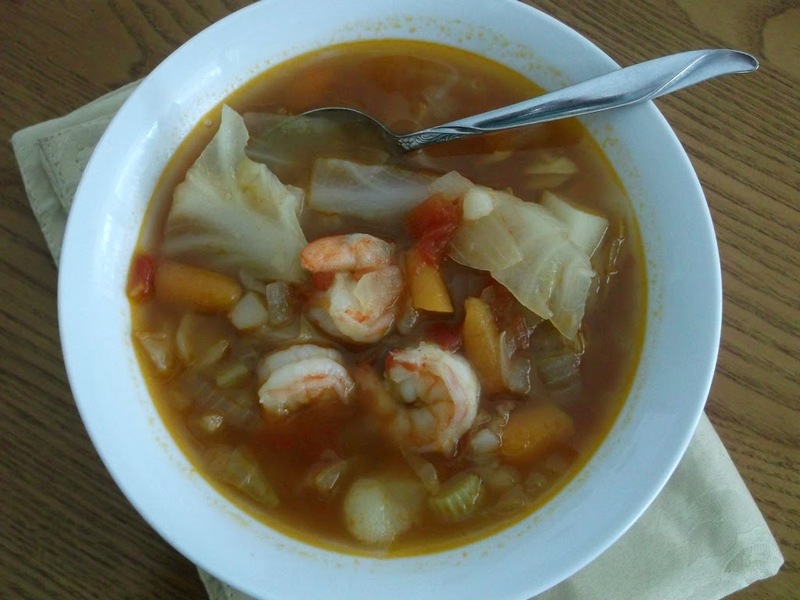 This is a simple soup, with a mild flavor and it turned out to be one of those great comfort foods. It made a great lunch, but would be wonderful for dinner with a salad. Remove the shells from the shrimp and place the shells into a small pan, cover with 3 cups of water. Bring the water to a boil, reduce heat and simmer covered for 15 minutes. 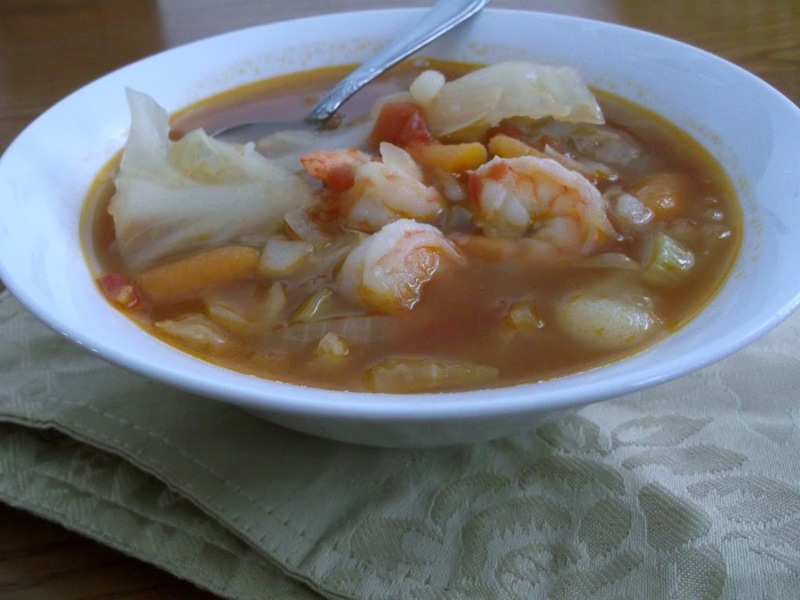 Strain the shrimp stock and discard shells. In a large soup kettle, heat oil over medium heat and add onions, celery, carrots, and potatoes, stirring occasionally until the vegetable begin to soften about 6 to 8 minutes. Add the vegetable broth, shrimp stock, clam juice, tomatoes, bay leaves, and cabbage bring to a boil. Reduce heat and continue to simmer until potatoes, celery, and carrots are tender about 30 to 40 minutes. Add the shrimp to the soup and continue to simmer for another 2 to 3 minutes until the shrimp turns pink. Remove the bay leaves and serve. I love fish, it doesn’t matter what kind. I guess it could be said that I haven’t eaten a fish that I didn’t like. Usually the fish I eat are made on the George Foreman grill or pan fried. While Mike was away on a business trip a while back ago I decided to experiment with baked fish. The first night of my experiments I was ready with a lime and olive oil and I was pondering which herbs I would try. I won’t go too much into detail with the lime version of my baked fish experiment, because it didn’t turn out the way I hoped it would. I know I added too much lime which made the fish way too sharp tasting for my taste buds. The second night I decided to try a little lemon instead of the lime, hoping for better results. I decided to keep it simple, which is sometimes the best. I went with olive oil, lemon, basil, onion, and a little garlic. Yum, it was much tastier and pleasing to me than the lime was. I had decided to make a couple of pieces of fish for my daughter Krista even though she was at work that evening. She decided to take it with her the following day for her lunch and she said that she enjoyed it as much as I did. 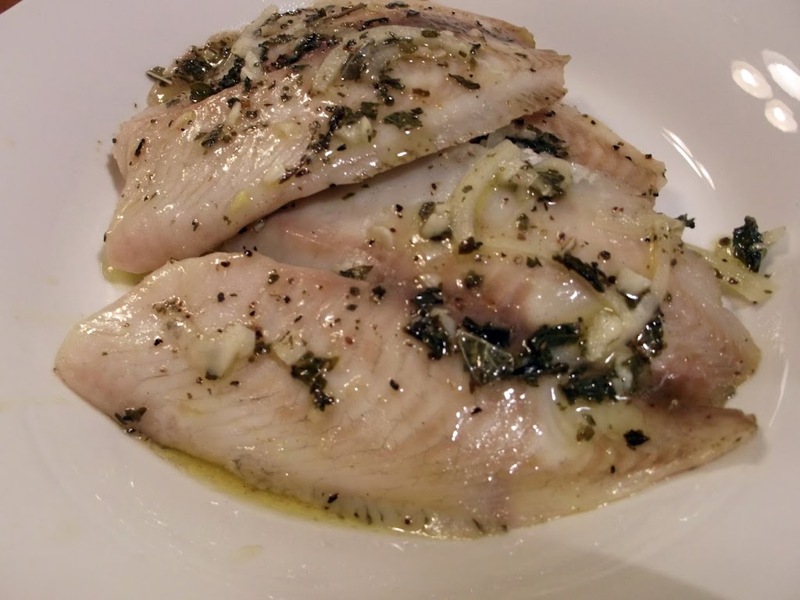 So with Lent starting this week, for those of you that are looking for a meatless dish I hope you will try this fish. I think that you will find it simple and pleasing to your palate. I am sure that you could use several different kinds of fish if you don’t care for the tilapia, but remember the baking time may change with the size of the fish. I hope you enjoy! Mix all ingredients except for the fish and mix well. Line a shallow baking dish with tin foil and stray with cooking oil of choice. 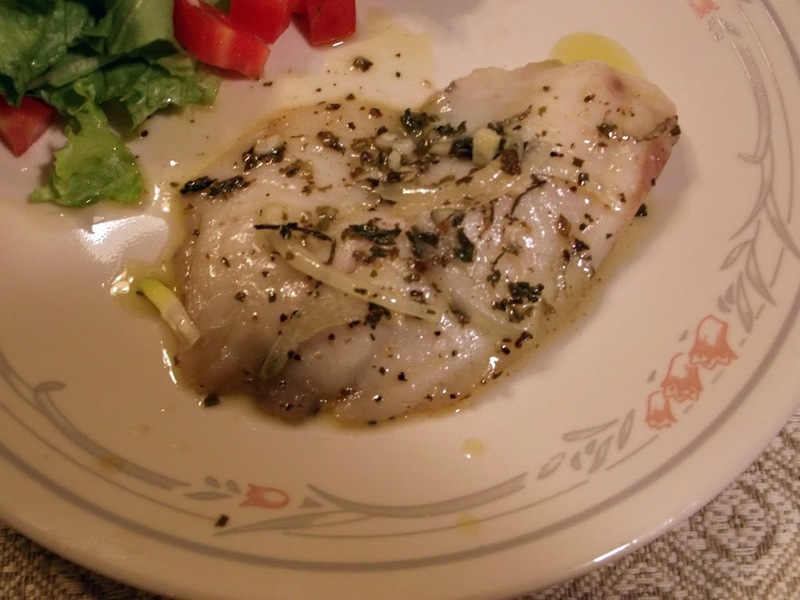 Place fish on tin foil and drizzle half of the olive oil mixture over the fish. Place the baking dish in the preheated oven and bake for 5 minutes. 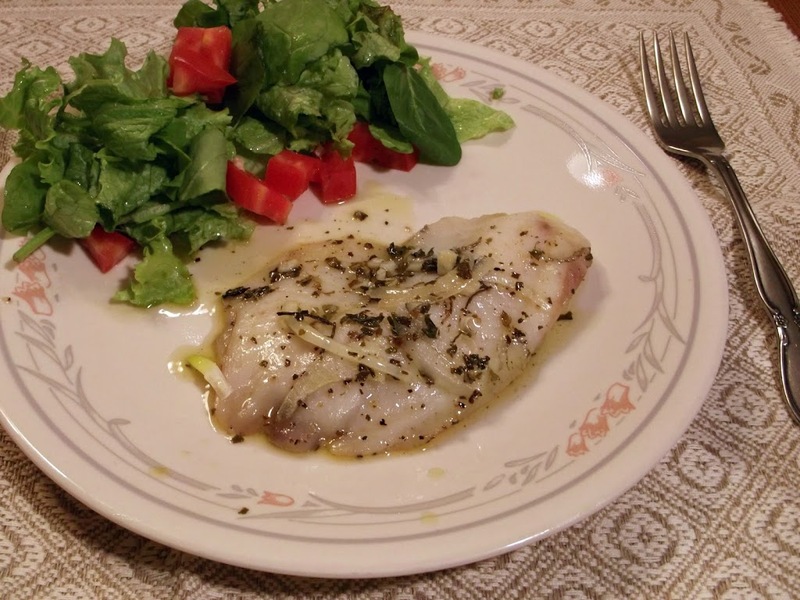 Take baking dish out of oven and flip fish, drizzle the remain olive oil mixture over fish and continue baking for 5 more minutes or until fish is done.